It’s the day after the American Thanksgiving and I’m sure the last thing anyone wants is an energy bar. However, it’s also Black Friday in the US and I figured maybe you could use some energy after all! There is very little that could pull me out of bed at midnight to enter long, cold line ups for hours on end, but these bars could just about do it. I actually whipped up these bars because we’re leaving on a vacation tomorrow. I always like to bring some type of energy bar with me when I go away and stash a couple in my purse when we’re out walking around. If I find myself without any vegan options, I have a bar that will hold me over until my next meal. I’ve never made an energy bar quite like this before. I added protein powder to rev up the protein in these bars, making sure they would give me sustainable energy when out and about. I wasn’t really sure what they would taste like with 1/2 cup of protein powder, but I was pleasantly surprised by the outcome! I made two batches, on the left, using 1/4 cup protein powder and on the right, using 1/2 cup protein powder. The bars using 1/2 cup protein powder were a bit more dense and the batter was drier, but otherwise I didn’t notice much of a difference taste-wise. Eric tried the bar on the left and he said he couldn’t even detect the protein powder at all. My suggestion is to use a very mild-tasting protein powder. 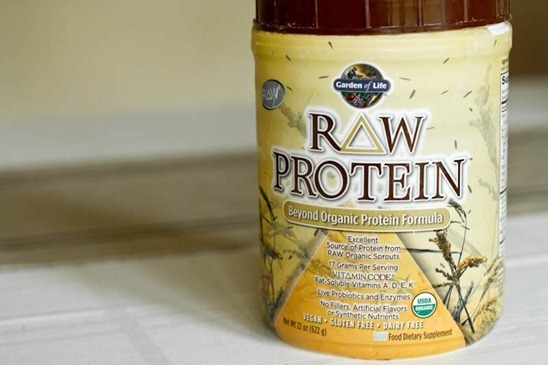 I loved using Garden of Life Brown Rice Protein Powder as it has a fairly neutral taste and it’s not sweetened. Just make sure whichever protein powder you use, it tastes good because you will taste it in the bars if it has an “off” flavour. Of course, you could also skip the protein powder all together if you prefer. If you cut 10 bars out of the batch, each bar has about 8 grams of protein when using protein powder such as this one below (17 grams protein per scoop). 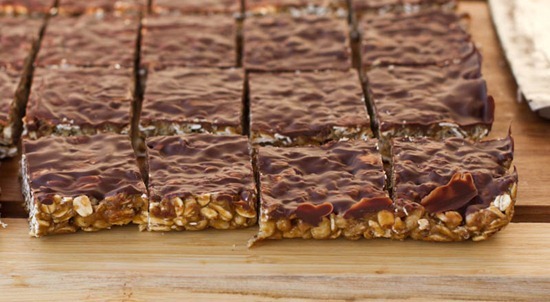 These no-bake bars take just 5 minutes to throw together…love that. I added a very THIN layer of melted chocolate on top of the bars and then chilled them in the freezer for 10 mins. I also made these nut-free, using the amazing Sunbutter sunflower seed butter! I found it at Whole Foods and it’s almost an exact knock-off of Trader Joe’s sunflower seed butter (or maybe TJ’s is a knock-off of this stuff!). Either way, it’s amazing stuff. If you haven’t tried lightly sweetened sunflower seed butter, you really must. It’s ultra drippy and smooth. Feel free to use any kind of seed or nut butter you prefer, but if it’s not very drippy you will probably have to add a bit more syrup. I also tried the bars (batch #2) using almond butter and it was also good, but I still preferred the sunflower seed butter. 1. In a large bowl, mix together the dry ingredients (oats, rice crisp, protein powder, cinnamon, salt). 2. In a medium-sized bowl, mix together the brown rice syrup and seed butter. Heat in microwave for 45 seconds and stir in the vanilla extract. 4. Press into a pan (with lightly wet fingers) and roll it out smooth with a pastry roller (optional). Melt chocolate in microwave and spread on top of the bars in a very thin layer. 5. Freeze for 10 mins. and cut into bars. Store in the fridge or freezer. 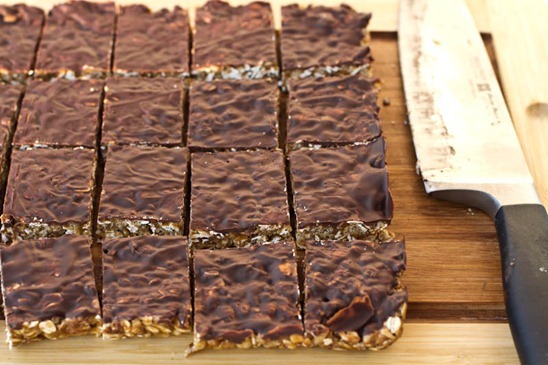 Notes: 1) Make sure to use a mild and good-tasting protein powder as the taste will really come through in these bars. 2) Feel free to use nut butters like almond or peanut butter as a sub for the sunflower seed butter, but make sure they are drippy or you will need to add more syrup. 3) Feel free to substitute honey for brown rice syrup as they both act well as a binder. I do not think maple syrup or agave would hold them together that well. 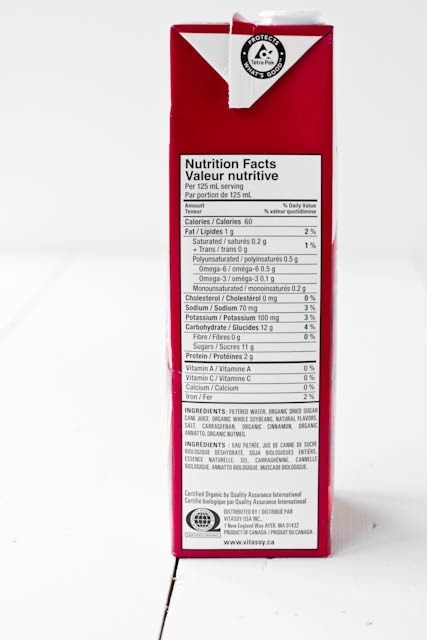 4) Gluten-free option: use GF certified oats, protein powder, and rice crisp cereal and double check all other ingredients for possible contamination. Approximate Nutritional info: (for 10 bars, without chocolate, using Garden of Life protein powder): 175 kcals, 7 grams fat, 24 grams carbs, 1 gram fibre, 10 grams sugar, 8 grams protein. 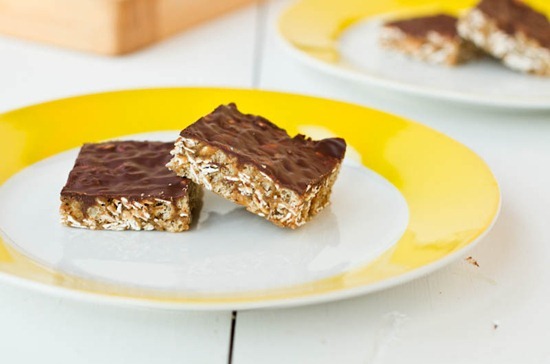 (for 10 bars, with 1/3 cup chocolate, using Garden of Life powder): 199 kcals, 8 grams fat, 27 grams carbs, 1 gram fibre, 13 grams sugar, 8 grams protein. I blended a half cup of Holly nog, 1/2 cup almond breeze, a frozen banana, nutmeg, and cinnamon and I was absolutely blown away by the outcome. It was exactly the texture I was looking for with the wonderful nog flavour that I love so much! This is what a picture looks like when the drink is SO good, I can’t even wait to snap the photo! I can’t control myself around this stuff. A proper photoshoot will likely never happen. This is as good as it gets. Oh wait, I just remembered I did take a photo of it a couple weeks ago! Here it is…before guzzling! I’ll be back this weekend with photo clues of where we are travelling…I’m excited to see if some of you will be able to guess it right away. I might have to make it challenging. mmmm! love quick protein bar recipes. These bars sound awesome Ange! I too have been experimenting with some protein bar recipes because I want to take some to Milan with me over Christmas, but I’ll add this one to my list as well. Happy travels and I can’t wait to see your trip photos! The bars look awesome. 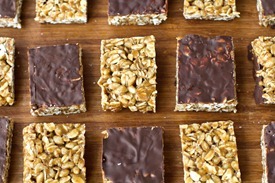 Oats, chocolate, and sunflower seed butter…3 of my all-time faves! I love making bars, balls, bites and cookies :) with any of them. Your bars look great and firm enough to take as a travel-snack and like they’ll hold up which is great. 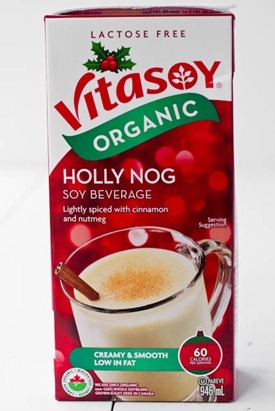 Do you have a preference between the Holly Nog and the So Delicious Nog? Is the Coconut one a bit too coconuty? I’m holding a holiday party next Friday and would love to try one of these brands out, but two friends of mine hate coconut so the So Delicious is making me double check. Thanks! I actually haven’t tried the coconut one yet, but I’ve heard it’s really good! The So Delicious definitely has a coconut undertone. I like it better than any of the other nog’s I’ve tried but if someone doesn’t like coconut they might not like it. It has a definite coconut flavor. It is delicious, but not quite as “noggy”. Anything that has Sunbutter in it is A-OK by me! :) These look delicious Angela. Just wondered if anyone knows a good spot to get protein powder in New Brunswick? I have looked everywhere and the brand here is soooo expensive! Any ideas? Or any great spots online to order it that isn’t over the top in price? Thanks ladies! Ohh, wow.. I can’t WAIT to try those protein bars!! they look sooo good. 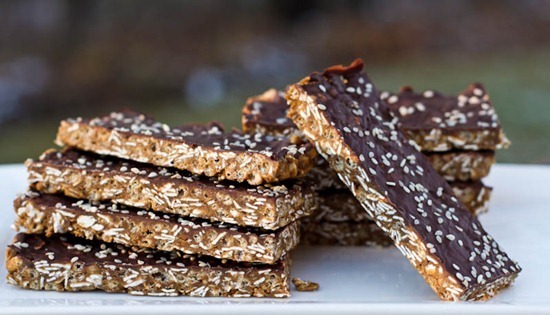 I’ve been on the lookout for a simple homemade protein bar recipe for my husband. I’m definitely going to give this a try! Mmm that looks amazing! :) Does the nog have a strong coconut flavour? I refuse to do the Black Friday thing but these bars still sound good to me :) Have fun wherever it is you’re going! These bars look so good. Thank you for the protein suggestion. Also Angela, do you think they would be good without the chocolate? After celebrating thanksgiving for over a week now I am feeling like I don’t need anymore chocolate! Have a wonderful trip wherever you are going! YUM! 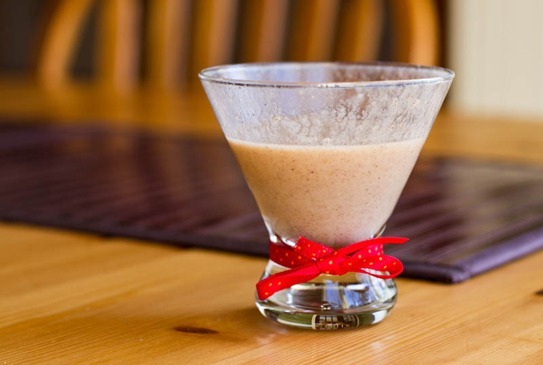 Vegan nog sounds delicious! I wish I could find that around me!!! The bars look great. When you say “brown rice crisp” do you mean cereal? Thanks! Yes I do…will add it to clarify thanks! You know, I ended up bprebaking it at 350 anyway, just cause I was doing 2 pies at once, so it was all good here, butthanks for correcting it. They were great! These look great, what could I sub for brown rice crisp?? I want to make these ASAP! You can sub regular Rice crispies cereal or maybe some kind of puffed cereal like puffed millet? OMG, these look so good. Might be worth bundling up my 6 month old and 3 year old to hit the store fort brown rice crisp cereal! Where is the picture of the new haircut??? I am leaving for Loblaws immediately! Oh man coconut butter is genius! I have never tried that, but will have to! I love your blog! I have made a few of your recipes and they are delish. I just started a blog and hope it’s OK to link to you. Cheers! Thank you! I was diagnosed with ovarian cancer at 32 yrs old so you’re vegan lifestyle is very interesting to me. I try to follow “clean” eating these days. I’m just starting my blog, but plan on expanding upon my experiences in this dept. Any advice is welcome. Cheers! I am obsessed with that sunflower seed butter! 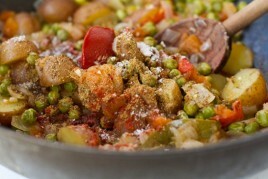 It tastes really amazing used in a savory stir fry sauce. Also these bars look great! I’ve been wanting to buy some protein powder to make my own protein bars, since all the packaged ones contain nuts of some kind. I can’t wait to try these! I’m happy to hear that Robin! Have a great trip! These bars look delicious. I’m still on the hunt for a protein powder that tastes amazing, but doesn’t have any freaky ingredients or items that upset my stomach. 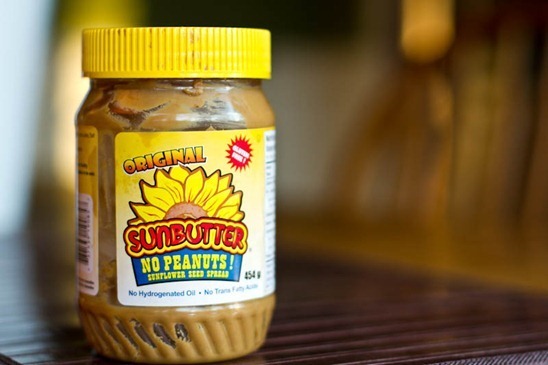 I just discovered sun flower seed butter (Trader Joes brand) and I love it! So creamy and a nice change from peanut butter. I always loved egg nog before I found out I was lactose intolerant, and also before I became a vegan. Since then, I only add a dash of nutmeg to my soymilk to make a fake nog, or I drink Silk soynog during the holidays (only available during Christmas time). And I LOVE protein energy bars/granola bars! Oh boy! And I love protein powder too! I use Shaklee protein powder, and that has a HUGE amount of protein per serving (31 grams for 3 tablespoons)…. and it’s vegan! I’m so totally going to make these! Thanks for the recipe! Most “energy bars” don’t have any more than 4 to 6 grams of protein. lol on the gluten-free pie crust recipe. I followed your instructions, but I always watch things pretty carefully when baking/cooking and I didn’t really think much about WHY my crust baked up so QUICKLY. They turned out great! thanks. Gulp….! I’m glad that you watched the crust. Sorry about the mix up! 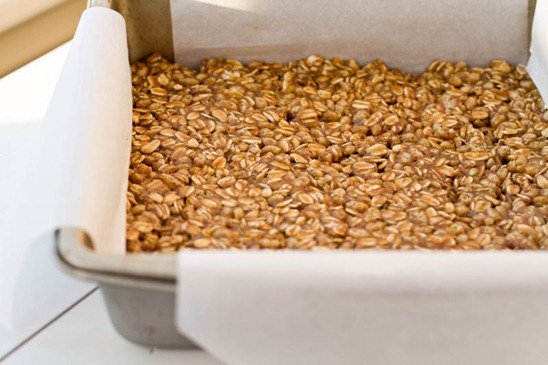 I always have a hard time with granola and oat bars since whether you bake them or not, they always seem to fall apart…so it’s good to hear that the protein powder gives them a little integrity! Afternoon Angela! I just finished using your recipe for protein bars pretty loosely. I doubled the oats, subbed rice kripspies, halved the liquid sweetener and used maple syrup instead, doubled the nut butter (but I used almond butter plus hot water) and added wheat germ and some nuts. I also made my own chocolate from cocoa powder and coconut oil. They are amazing! Thank you for the inspiration. 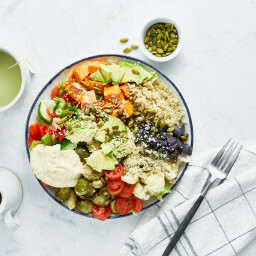 I’m not too sure where you’re located in the GTA, but there is a Rawlicious opening in Markham within a week or so if you find yourself in that neck of the woods. Glad the bars worked for you…great add-ins! Hi Angela! I just love your website! I check it ALL THE TIME. You’ve inspired me to be a vegan too (been vegetarian a yr and two months now). I even brought a vegan cherry pie to Thanksgiving dinner yesterday! :D Keep the posts coming. 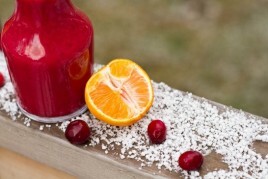 ooooh, the holly nog smoothie is calling my name! so festive and it looks delicious! Can’t wait to try these! Thanks for the great idea! I find honey can work in replacement of BRS as it has the same consistency. Enjoy! ARGH! That temperature discrepancy makes me feel like less of a failure better at least. 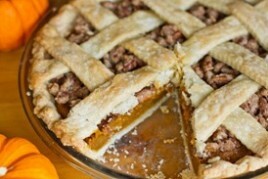 I prebaked the pie crust at 425 and it did NOT turn out. The crust stuck pretty bad and was very dry and stuck to the pan by the time all was said and done. Maybe my family will be willing to try it out again and let me redeem myself. 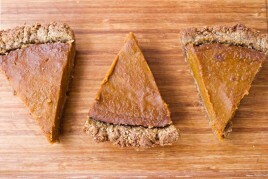 :) I’m just new to this whole vegan and gluten-free baking thing, (i.e. haven’t done many non dairy or even gluten-free baked goods) so if I had more of a knowledge base to work from, I might have been able to catch the crust in time like other readers seemed to. On an unrelated note, I’m going to get the stuff to make these protein bars pronto! Nut-free gluten-free and vegan to boot! I’m sold! Ooh! We have Vitasoy in Australia! I will be crossing my fingers to see that nog drink :D Great energy bars too. 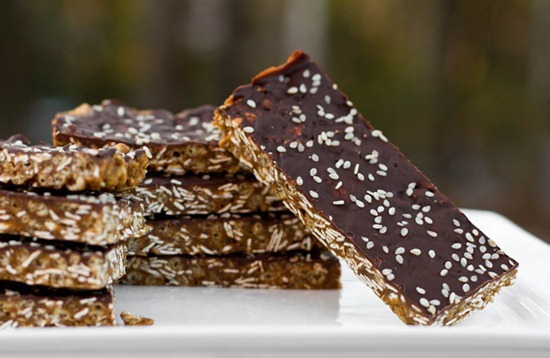 I just made these bars and sprinkled them with flaxseeds! Delightful! Angela, you NEVER disappoint! :) Thank you for another inspiring recipe. Glad you like them Hilary! I’m GTA as well and found the same sunbutter at Superstore! Fun fact: when you bake with Sunbutter, it often turns green! Well, when you mix it with baking soda. I made monster cookies and by the second day, the outside of the cookie looked normal but they were bright green inside! They were great for work (I’m a teacher in a nut-free school). That’s funny about it turning green! thanks for letting us know about holly nog! You should try the coconut Nog made by So Delicious, it is just that! Good morning! 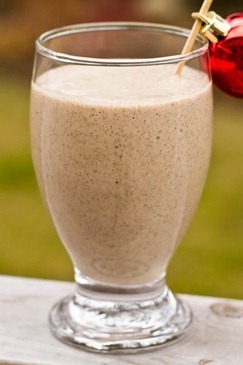 The egg nog smoothie looks delish!! When I was a kid I never liked egg nog, maybe I’ll give it another try? With all these holiday flavors, you just have to love this time of year!! Having your energy bars is a must too!! Such a fan of the no bake recipes! My husband always loves those (especially the ones from this blog). Trying this with almond butter and maybe some dried cranberries mixed in. definitely will have to look out for holly nog.. I tried to coconut milk nog which was delicious! THANK YOU for posting this egg nog recipe because I totally picked this up at Zehrs the other day and on it’s own, it’s a little too much for me. I can only imagine how good the frozen banana would make it. Putting a banana in the freezer RIGHT now and doing this in the morning ;) You genius!!! I just made these, and they are delectable! Very nice; chewy and crunchy at the same time! Instead of sunflower seed butter (I can NEVER find that!) I used peanut butter and it worked like a charm! Those are absolutely gorgeous! YUM! 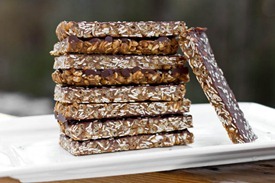 Just made these Protein bars! I subbed in Chocolate Whey Protein Powder (all we had in the pantry), and I made my own sunflower seed butter (just put roasted, UNSALTED sunflower seeds in the food processor till smooth). These turned out DELICIOUS! I also added in 1 TBSP of cocoa just to amp up the cocoa flavor. The husband had no clue there was chocolate in them, they are just GOOD! Looking forward to taking these bars to work (and to class!) this week! Thanks! These protein bars are amazing!! My husband rarely eats anything that he knows is vegan or healthy in any way…but he LOVES these!! Thanks for posting!!! i am so making the nog thing!! I saw “flax egg” in some recipes. If I want to replace it with egg white, how many of them can be replaced with 1 flax egg (1 tbsp ground flax + 3 tbsp water)?? Thanks! These look great, but will the bars hold together just as well without the chocolate? I don’t really like the taste of chocolate by itself so would prefer to leave it out. By the way, literally every recipe I’ve tried from your website has come out perfectly the first time. Sometimes I’ve wanted to make a few flavour tweaks (like next time I’ll make the ultra fudgy brownies, brownies being the one place I do like chocolate, a bit sweeter) but they’ve always been fun to make, come out perfectly and liked by everyone who tries them. I’m sorry about that Laura! Loved the holiday nog recipe!! I couldn’t believe how good the soy egg nog tasted especially with only 60 calories per cup. The shake was delicious and healthy, great job as always! I made these and omitted the cinnamon and protein powder then I used peanut butter and added peanuts! It was to die for!!!!!! Just made a batch! Modifications: puffed millet cereal instead of rice, peanut butter instead of sunbutter, and three mashed bananas instead of brown rice syrup. Peanut butter, chocolate, and banana is an amazing combo. Thanks for the simple and adaptable recipe. So delicious! I made a batch of these energy bars to take to Science Camp… I hope they make it until tomorrow when we leave! Oh my gosh, that eggnog smoothie sounds SO GOOD! I hope they sell Holly Nog at my local store! Wow! Great bars!!! Even my picky 10 y.o. loved them. I used Nuts To You brand sunbutter, but it’s a bit thicker than the brand you used, I think I’ll hit SuperStore for the other brand next time. Worked out very well, with 1/4 c hemp powder. For the topping I used the 1/3 c chocolate chips with 1Tbs sunbutter melted in with it. You didn’t state pan size? I used a 9×9 pan, and cut into 16 smallish squares. I think I used both an 8″ one time and the next time a 9″, either is good! Glad you liked them! Do you think home made jam would stick to these bars or is there a way to incorporate it into the recipe? I would love to make my own blueberry bliss luna bar. hmmm Maybe you could stir a bit of jam into the batter before spreading it into the pan? Have been making the protein bars and they are hit! It was a great binder and keep the bars super tasty. Coconut Nectar is a good low-glycemic alternative. Have been following your blog for some time now and it’s been awesome for getting my health back in order. I’m leaving for vacation soon and these bars would be a huge help to me particularly since I have difficulty maintaining my healthy eating habits when fresh fruits and veggies aren’t always attainable. I was just wondering, if I left out the protein powder (prefer to) would it be ok if I added shredded coconut, slivered almonds or sunflower seeds and chia seeds? I can’t see why not! Just make sure the batter doesn’t get too dry or it may not hold together. happy vacationing! Yum – these look great! & I just picked up sunflower butter from Trader Joes today!! Love that stuff! Will these turn soft if they are kept at room temperature? I would like to make them for my son’s school snack? I brought them on a trip with me and while they bent a bit in my bag, they stayed intact and were quite portable. Enjoy! Just made the bars (and ate one!) They are wonderful – thank you for the recipe! I made these last night, and they are so yummy! I used 1/4 cup protein powder, but next time I will try 1/2 cup. I cannot taste it at all, but I was worried that I would. These are so easy to make! Just made the bars and they are great! Didn’t use protein powder but instead subbed 1/4 C of Amazing Grass Green Superfood powder (the chocolate flavored one). Also used whatever cereal crumbs we had left at the bottom of the boxes, which ended up being a combination of bran flakes and Crispix. YUMMY! They wil be perfect for our road trip tomorrow. Thank you! These bars are so yummy!! My only criticism is that it’s extremely difficult to stop at one…they are too good. :) A friend of mine recently told me about your site when she raved about the “best” vegan burgers (they are…she didn’t lie to me), and I am addicted! Every recipe I have tried so far is badass. I made the protein bars and they are fantastic! I added milled flax seed to the chocolate and roasted almonds to the top. Made them taste so good! Thank you for putting this information out there for people like me. My husband and I are new Vegans and we are already loving it. We didn’t eat a lot of meat any way. 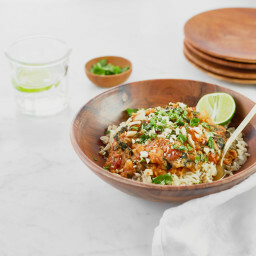 What can you use instead of brown rice syrup? I don’t know of a substitute, sorry! Just about anything, actually. I use a combination of honey and agave, but just about any syrup will do. Make would probably be great. hooked on your site after reading “Eat to Live”. I got brown rice puffs not crisps by accident, will that work? And I have the raw vanilla powder, will that make it too sweet or odd tasting? I’m worried because I don’t want to waste any of the ingredients. Just got back from the store and realized your recipe called for crisped rice cereal, I got puffed rice. Do you think it will be ok? I just don’t want to waste all the other ingredients. Thank you! I LOVE these bars as do my two girls. They take them to school (thanks to being nut free!!) for recess and after school treats. Just wondering if I could freeze some after cutting them into bars? It would be great for those busy weeks to prep ahead a little. What can we use instead of rice syrup? We can’t do rice around here. Hi Ashlee, I think you could successfully substitute honey for brown rice syrup (if honey is a part of your diet, of course). Someone also has said they’ve used a combination of honey and agave syrup in the past; I suspect agave on its own might not be binding enough, though (same for maple syrup). Hope this helps! If you try anything please let us know how it goes! I made these years ago when you first posted them — and I keep coming back to them. I just made another batch today and can’t wait until they’re chilled! Thanks for all your great ideas.